The distinction between “residence” and mailing address should not be lost sight of. See MPEP § 602.08(a). For a patent application publication to be published with residence information that differs from that originally filed, the revised information must be entered into the Office electronic records at least nine weeks before the publication date of the application. For patent applications filed on or after September 16, 2012, in order for a patent to issue with the new residence, applicants must file a corrected Application Data Sheet (37 CFR 1.76(c)) showing the new residence information with underlining for insertions and strike-through or brackets for text removed. See MPEP § 601.05(a). For applications filed prior to September 16, 2012, applicants are strongly encouraged to file a Supplemental Application Data Sheet showing the new residence information preferably with underlining for insertions and strike-through or brackets for text removed. See MPEP § 601.05(b). In the first action on the merits of an application, the examiner must record in the appropriate sections of the OACS or Official Correspondence “Search Notes” form the areas in which the search for prior art was made. The examiner must also indicate the date(s) on which the search was conducted and provide his/her initials. In subsequent actions, where the search is brought up to date and/or where a further search is made, the examiner must indicate that the search has been updated and/or identify the additional field of search and include the date and the examiner’s initials in the appropriate sections of the “Search Notes” form. Any search updates should include the appropriate databases and the search queries and classifications employed in the original search. See MPEP § 904. Great care should be taken so as to clearly indicate the places searched and the date(s) on which the search was conducted and/or updated. Searches are listed in the “SEARCHED” boxes and/or "SEARCH NOTES" box of the "Search Notes" form. 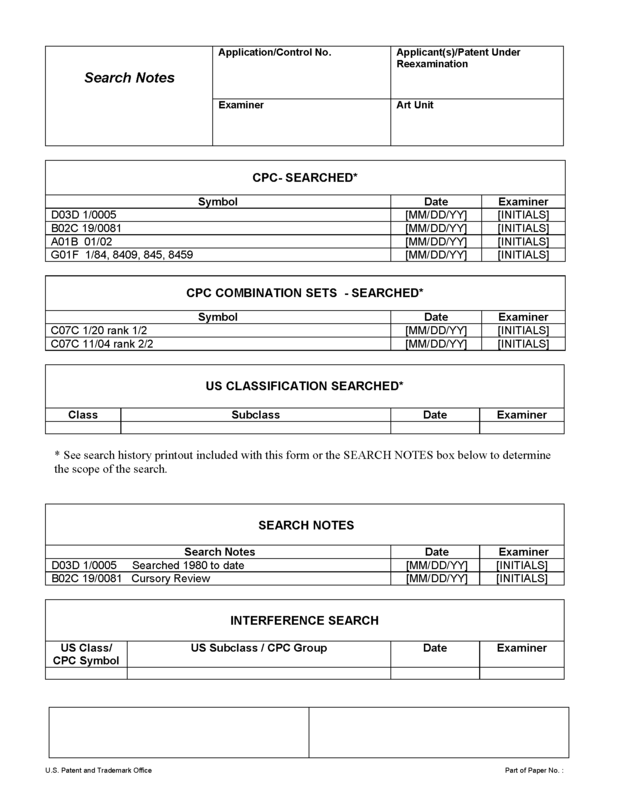 For example, in the sample “Search Notes” form reproduced below, the “SEARCH NOTES” box indicates how the Search was limited for documents classified under CPC symbols D03D 1/0005 and B02C 19/0081. The absence of entries in the “SEARCH NOTES” box for the other classification symbols searched indicates that all documents having those symbols were reviewed or there is a search history printout in the file indicating how the search of those symbols was limited. As provided in subsection II.B below, a complete search history in the form of a printout must be included in the application file any time an electronic search was performed. The Search Notes form includes three “SEARCHED” boxes for recording searches in Cooperative Patent Classification (CPC), CPC Combination Sets and U.S. Patent Classification (USPC). When documenting a classification search, as described below, the examiner should ensure the proper box(es) is/are used. A classification search is defined as a search of the documents in a particular classification location, whether classified by CPC or USPC, and may be limited by a text query, filters or other means. When a classification search is performed, the classification symbol must be recorded in the appropriate “SEARCHED” box section of the “Search Notes” form along with the date that the search was performed (or updated) and the examiner’s initials. When a classification search is limited, the examiner must ensure that how the search was limited is made of record. In most situations, how the search was limited would be apparent in a search history printout and in these situations, the examiner should include the printout with the “Search Notes” form when making the "Search Notes" of record. When the search is limited by an approach not apparent in the search history printout, the manner in which the classification search was limited should be made of record by annotating the “SEARCH NOTES” box. Unless a search of all of the documents for a particular classification location was performed, it would be inaccurate to merely record the classification symbol in the “SEARCHED” box without including the search history printout or indicating how the search was limited in the “SEARCH NOTES” box. Entries made in the “SEARCH NOTES” box are of equal importance to those placed in the “SEARCHED” box. They are intended to complete the application file record of areas and/or documents considered by the examiner in his or her search. If a text search was performed in a particular database and no classification search was performed, the following entry or its equivalent must be recorded in the “SEARCH NOTES” box of the “Search Notes” form: “See search history printout(s)” along with the date or dates that the search was performed (or updated) and the examiner’s initials. A search history printout must also be included in the file. See subsection II.B below. The staff of the STIC provide non-patent literature (NPL) and foreign patent searches to examiners on request through the Electronic Information Center (EIC) located in each Technology Center. STIC staff use commercially available databases to provide text, chemical structure, sequence, litigation, inventor, and other types of searches. To request a search, the examiner must fill out and submit a search request form via the STIC NPL Web page. It is important to provide as much relevant information as possible to assure that the search meets the examiner’s needs. Examiners are encouraged to fill out the request form completely and/or to discuss their search needs with the EIC search staff. The full text of any citations included in the search results will be provided at the examiner’s request. The search conducted by the EIC will include a complete search history. The complete search history in the form of a printout must be included in the application file. The following entry or its equivalent must be recorded in the “SEARCH NOTES” box of the “Search Notes” form: “See search history printout(s)” along with the date that the search was performed (or updated) and the examiner’s initials. EIC search staff can also assist examiners in conducting their own search of NPL databases. (E) A consultation with other examiners to determine if relevant search fields exist in their areas of expertise. If the subclass is not searched, record the class and subclass, if any, discussed, followed by “(consulted).” This entry may also include the name of the examiner consulted and the art unit. A cursory or browsing search through a number of materials that are not found to be of significant relevance may be indicated in a collective manner, e.g., “Browsed STIC shelves under QA 76.5” or “Browsed text books in STIC relating to......................” More detailed reviews or searches through books and periodicals or any search of terms in abstracting publications should be specifically recorded, however. Record the application number of a parent application, followed by “refs. checked” or “refs. ck’ed.” If for any reason not all of the references have been checked because they are not available, such exceptions should be noted. Regarding nucleotide and peptide sequence searches, these searches must be documented by printout(s). A copy of a printout for each database source searched must be included in the application file. Each printout must include all the information up to the “ALIGNMENTS” section. When an application is in condition for allowance, an interference search must be made by performing a text search of the “US-PGPUB” database in EAST or WEST directed to the comprehensive inventive features in the broadest claim. If the application contains a claim directed to a nucleotide or peptide sequence, the examiner must submit a request to STIC to perform an interference search of the sequence. Completion of the interference search should be recorded in the “INTERFERENCE SEARCH” section of the “Search Notes” form with an identification of the manner in which the interference search was limited (if any) in the “Search Notes” by providing an appropriate annotation. For an indication of consideration or nonconsideration of prior art citations submitted by applicant in Information Disclosure Statements (37 CFR 1.97 and 1.98), see MPEP § 609et seq.